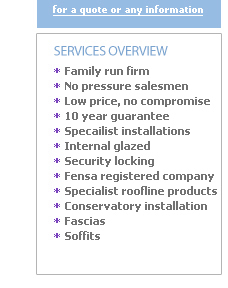 This well established family business with over 40 years combined experience offers a one stop shop for all your replacement windows and maintenance-free product requirements, including UPVC doors, windows, patios, conservatories, porches, double glazed units, fascias, soffits and guttering. Our work covers all over Macclesfield. Windows, Doors, Conservatories, Fascias, Soffits, Guttering, Replacement Glass & Door Panels. Low maintenance products are probably the most popular reason for installation - no more sanding, no more painting, no more rotting, sounds like a great reason to me! One of the most under-rated reasons for replacement is the reduction in outside noises as windows have been vastly improved over the last few years from 60mm depth windows to 70mm depth, double glazed units from 20mm to 28mm depth with k glass incorporated to further reduce heat loss. Whatever your reason for windows, doors, fasciaS and soffits, you would be well advised to call Firstchoice Windows in Macclesfield on 08453 477338 and ask for Sean - he will be pleased to help.